People need to understand something: just because a man says some things you like and wears your political team’s jersey does not make him right nor lawful. President Trump has said good and bad things. President Trump has engaged in both constitutional and unconstitutional actions. He has also appointed numerous unAmerican people to positions in our government with the latest having been Justice Brett Kavanaugh. Now, he’s putting up William Barr for Attorney General, a man who is a gun confiscation advocate, which disqualifies him from the office. 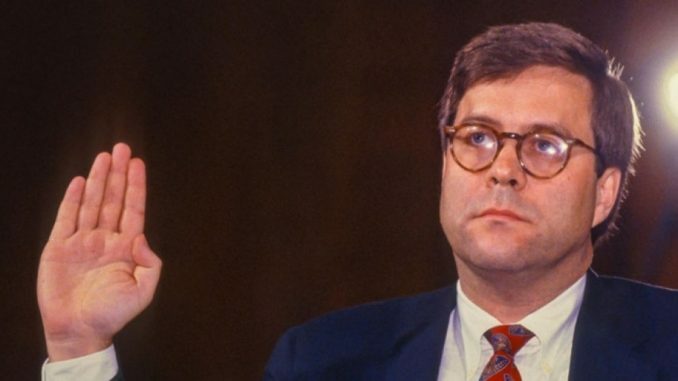 William Barr served previously as Attorney General under President George H.W. Bush from 1991-1993. And where does Barr get his authority for such things? I can tell you it isn’t in the US Constitution. He would usurp that authority. I wouldn’t be surprised if, during the hearings, Barr defends his past support for gun control by reiterating what he said in 1991. That is, he supported firearms restrictions as part of a grand bargain to get several “tough on crime” provisions. But that excuse is not going to fly with the pro-gun community. Because our rights are protected by the Constitution and they can’t be bargained away or negotiated. Barr might also say his support for gun control was “pre-Heller” — as if that really makes a difference. If that is Barr’s excuse, then that just means Barr believes that outlawing a large category of firearms is “okey-dokey” if it’s alright with the Supreme Court. Either way, these excuses won’t fly. Look, I realize that someone’s views can change in 20-plus years. Criminologists like Dr. Gary Kleck have changed their views on gun control. So have judges like Sanford Levinson … law enforcement such as Officer John Cardillo and Pinellas County Sheriff Bob Gualtieri … legislators like Rep. Ron Silver … media executives such as NPR CEO Ken Stern. As for Barr, we don’t have any recent statements from him on gun control (pro or con). But unless Barr can publicly renounce his previous views on gun control and publicly oppose the positions advocated by his boss-to-be — by taking a firm and unequivocal stand against Red Flag Gun Confiscation Orders — then we’re calling on the Senate to reject his nomination. While I agree with Pratt that someone’s view can change, the fact of the matter is that if this guy’s view would have changed, we would have heard about it by now. Don’t be surprised if there is not another rope-a-dope with Barr to get “conservatives” to support him for some other reason other than he is constitutionally qualified, just like they did in the Kavanaugh hearings. Please urge your Senators to vote NO on William Barr, unless the candidate demonstrates indisputable support for the Second Amendment.